For the eighth consecutive fall, Indiana University East is reporting an increase in enrollment, a trend that has steadily continued since fall 2007. IU East’s fall headcount of 4,716 represents a 3.1 percent increase compared to last year. Students are enrolled in 42,410 credit hours this fall, a 0.8 percent increase over last year. This year, the incoming freshman class at IU East is the most academically qualified the campus has enrolled to date. The Class of 2019 makes up the largest age group of students on campus. There are 1,359 students ages 20 and under enrolled at IU East. The second highest age group, ages 20-24, includes 1,243 students. “IU East continues to be the school of choice for many of our students entering college right out of high school,” Cruz-Uribe said. 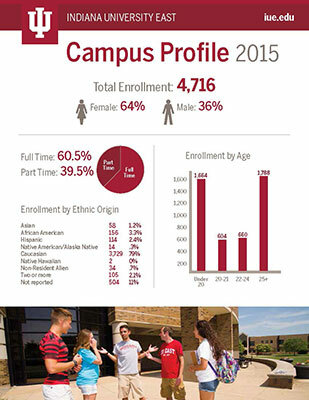 Another demographic that is growing for IU East is the number of graduate students. This fall marks IU East’s highest number of graduate students enrolled in master’s programs, up 12.8 percent from fall 2014. IU East offers six graduate programs in education, English, management, nursing, social work and teaching mathematics. Additionally, the campus set a record enrollment for students of Hispanic/Latino, Asian American and two or more races. IU East’s primary mission is to provide bachelor’s and graduate education to students in eastern Indiana and western Ohio. Many of those students take online courses, in addition to on campus courses. The campus offers 11 bachelor’s degree online completion program options, as well as Graduate Certificates in Composition Studies and Mathematics. Online programs continue to grow at IU East, with many students taking a mix of online and in class courses. Enrollment by county for Indiana shows the highest number of IU East students are from Wayne County, followed by Randolph, Henry, Dearborn, Fayette, Franklin, Rush and Union counties. IU East also enrolls a number of students from Ohio as part of the reciprocity agreement, including students primarily from Preble, Darke, Butler, Shelby and Mercer counties. Official enrollment numbers were released by Indiana University on September 4.